Prepare yourselves, resident villa owners of North Cyprus, for more relatives visiting you this autumn! 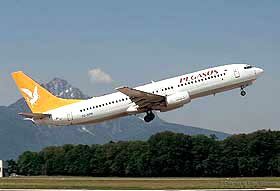 Pegasus Airlines have announced two new flights from Stansted to Ercan international via Istanbul. A new Monday flight will be available from 1 September 2008, with an additional Friday flight added from 1 October 2008. Ticket prices start for the Istanbul leg at only £40 one way, including taxes. This now means your sisters, and your cousins (whom you reckon up by dozens, as G&S would say) and your aunts can fly out to see you five days a week. Seriously, this can only be good news for North Cyprus tourism. While we swelter in 35 degrees plus, the UK is having an dreadful summer full of grey skies and ho-hum temperatures. I am quite convinced that by September, half the nation will be desperate to escape to the sun - but on a budget. This is North Cyprus' chance to grab those bargain-hunters and show them that great beaches, endless sunshine, friendly restaurants and historic wonders do exist north of Nicosia. North Cyprus Flights are available to book online now. Just don't tell my mother-in-law, OK? This web page is served on 19 April 2019 at 23:20:31.